BUY TICKETSE-Tickets are available for our charity events. Polo is a team sport played on horseback in which the objective is to score goals against an opposing team. Sometimes called “The Sport of Kings”, it was started by Persians, and was popular in Iran until 1979, after which its popularity there declined sharply due to the Iranian Revolution. Players score by driving a small white plastic or wooden ball into the opposing team’s goal using a long-handled mallet. The traditional sport of polo is played at speed on a large grass field up to 300 yards long by 160 yards wide, and each polo team consists of four riders and their mounts. Field polo is played with a solid plastic ball, which has replaced the wooden ball in much of the sport. 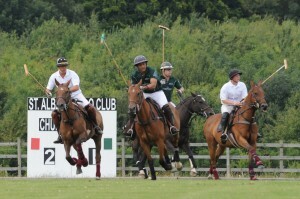 In arena polo, only three players are required per team and the game usually involves more maneuvering and shorter plays at lower speeds due to space limitations of the arena. Arena polo is played with a small air-filled ball, similar to a small soccer ball. The modern game lasts roughly two hours and is divided into periods called chukkas (occasionally rendered as “chukkers”). Polo is played professionally in 16 countries. It was formerly, but is not currently, an Olympic sport. The modern game of polo, though formalised and popularised by the British, is derived from Manipur (now a state in India) where the game was known as ‘Sagol Kangjei’, ‘Kanjai-bazee’, or ‘Pulu’.It was the anglicised form of the last, referring to the wooden ball which was used, that was adopted by the sport in its slow spread to the west. The first polo club was established in the town of Silchar in Assam, India, in 1834.There is also a polo ground in chooto jalanga (irongmara/dwarbond). The origins of the game in Manipur are traced to early precursors of Sagol Kangjei.This was one of three forms of hockey in Manipur, the other ones being field hockey (called Khong Kangjei) and wrestling-hockey (called Mukna Kangjei). Local rituals such as those connected to the Marjing, the Winged-Pony God of Polo and the creation-ritual episodes of the Lai Haraoba festival enacting the life of his son, Khori-Phaba, the polo-playing god of sports. These may indicate an origin earlier than the historical records of Manipur, which go back to the 1st Century A.D. 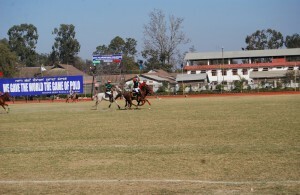 In Manipur, polo is traditionally played with seven players to a side. The players are mounted on the indigenous Manipuri pony, which stands less than 13 hands (52 inches, 132 cm). There are no goal posts, and a player scores simply by hitting the ball out of either end of the field. Players strike the ball with the long side of the stick (not the end as in croquet; players are also permitted to carry the ball, though doing so allows opponents to physically tackle them when they are doing so. The sticks are made of cane, and the balls are made from the roots of bamboo. Colorful cloth pom-poms dangle at sensitive and vulnerable spots around the anatomy of the ponies to protect them. Players protected their legs by attaching leather shields to their saddles and girths. In Manipur, the game was not merely a “rich” game but was played even by commoners who owned a pony.The kings of Manipur had a royal polo ground within the ramparts of their Kangla Fort. Here they played Manung Kangjei Bung (literally, “Inner Polo Ground”). Public games were held, as they are still today, at the Mapan Kangjei Bung (literally “Outer Polo Ground”), a polo ground just outside the Kangla. Weekly games called Hapta Kangjei (Weekly Polo) were also played in a polo ground outside the current Palace. 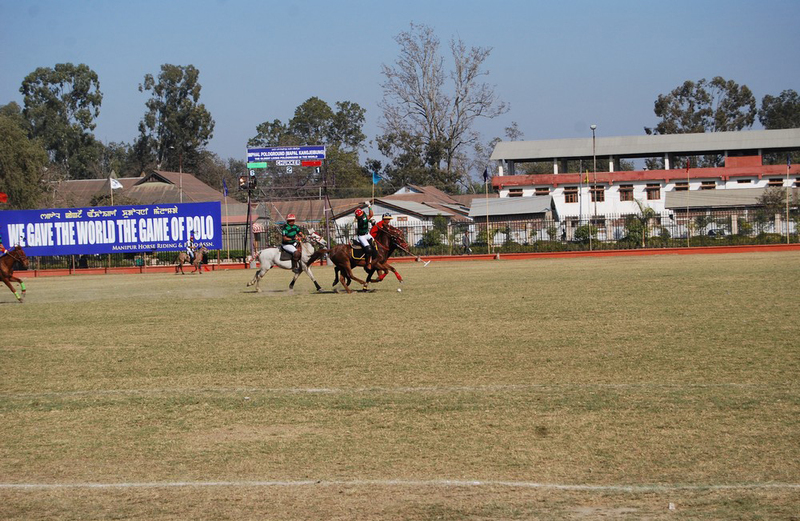 The oldest polo ground in the world is the Imphal Polo Ground in Manipur State. The history of this pologround is contained in the royal chronicle “Cheitharol Kumbaba” starting from AD 33. Lieutenant Sherer, the father of modern polo visited the state and played on this polo ground in the 1850s. Lord Curzon, the Viceroy of India visited the state in 1901 and measured the pologround as 225 yards long and 110 yards wide. The oldest royal polo square is the 16th century Gilgit Polo Field, Pakistan, while the highest polo ground in the world, Shandur, located in district Chitral, Pakistan at 4,307 metres (14,131 feet). A traditional polo tournament between the teams of Chitral and Gilgit takes place every year in July. Maj Cobb from British Raj was a polo fan and he used to come to Shandur for playing polo on the invitation of Mehtar Chitral in moon light. 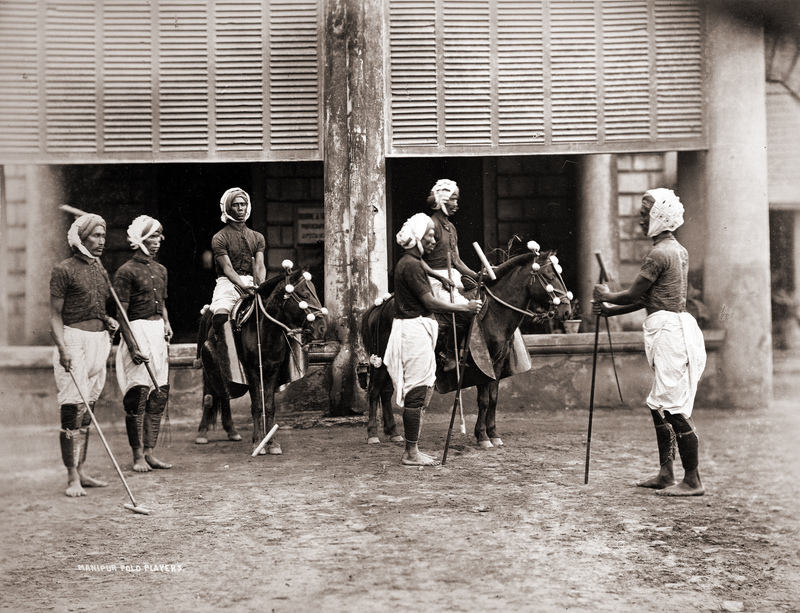 In 1862 the first polo club, Calcutta Polo Club, was established by two British soldiers, Captain Robert Stewart and Major General Joe Shearer.Later they spread the game to their peers in England. The British are credited with spreading polo worldwide in the late 19th century and the early 20th century. Military officers imported the game to Britain in the 1860s. The establishment of polo clubs throughout England and western Europe followed after the formal codification of rules.The 10th Hussars at Aldershot, Hants, introduced polo to England in 1834. The game’s governing body in the United Kingdom is the Hurlingham Polo Association, which drew up the first set of formal British rules in 1874, many of which are still in existence. Copyright © 2019 St Albans Polo Club.